The perennial problem how to travel in style but be practical too? The issue of luggage is a tricky one especially as you are confronted with different regulations depending on the airline and country of departure. Leaving Australia you can quite happily waltz past the customs officers with both a cabin bag (so long as it doesn’t weigh more than 7 kg) and a good sized handbag (think shoulder bag or day bag). Leaving UK on the same airline (in this case Emirates) it can be a very different story. Only 1 piece of cabin baggage allowed for economy class passengers (in Manchester) which meant having to switch quickly into the queue with the less strict airline official as I certainly did not wish to be faced with the conundrum of how to squash my handbag into my already well packed cabin bag and on this occasion (a couple of years ago) I was travelling alone so couldn’t offload baggage onto Monsieur Le Chic as per normal. We’ve flown from quite a few airports most recently Zurich which we’ve used a few times and the general rule is only 1 cabin bag per person (unless you are fortunate enough to be a business or first class traveller). Certainly at Zurich they check your cabin bags carefully when you check in for the flight and you get a nice little tag to tie onto them if they are approved. Low cost airlines within Europe such as easyJet and Air Berlin are also equally strict although you can get away with a slightly larger cabin bag and weight limit (to encourage people not to check in baggage at all). EasyJet don’t have a weight limit as such but the cabin bag dimensions must be no more than 56 x 45 x 25 cm or slightly less to be guaranteed if the flight is particularly busy (otherwise they have to be checked in to the hold). Air Berlin specify similar dimensions on their 1 cabin item but the weight limit is 8 kg. This isn’t practical if you’ve flown from Australia but are now touring in Europe. You’ve got a smaller cabin bag so as to meet regulations on most international flights and you don’t want to go out and purchase a larger cabin bag just so you can put a handbag into it and you certainly don’t want to shoe horn a very nice handbag into your suitcase. Unbelievably I once was told at Bristol airport first thing in the morning when I’m not at my best (as Monsieur Le Chic well knows) to go and buy duty free so I could put my “excess” handbag in the duty free bag otherwise I would not be allowed on the plane (easyJet to Innsbruck). Having followed these instructions to the letter I filed onto the plane with the 24 other passengers (on a plane that seated 156) with my cabin bag and a large duty free bag (containing 2 duty free Dior mascaras for my daughters Mlle Chic Fille and La Chic Maman back home and my “over the limit” handbag). 1 Cabin Bag (actually a Mimco baby bag I kid you not!). It’s very practical, has all sorts of nifty compartments so useful for travel, and looks stylish enough to be a larger handbag. 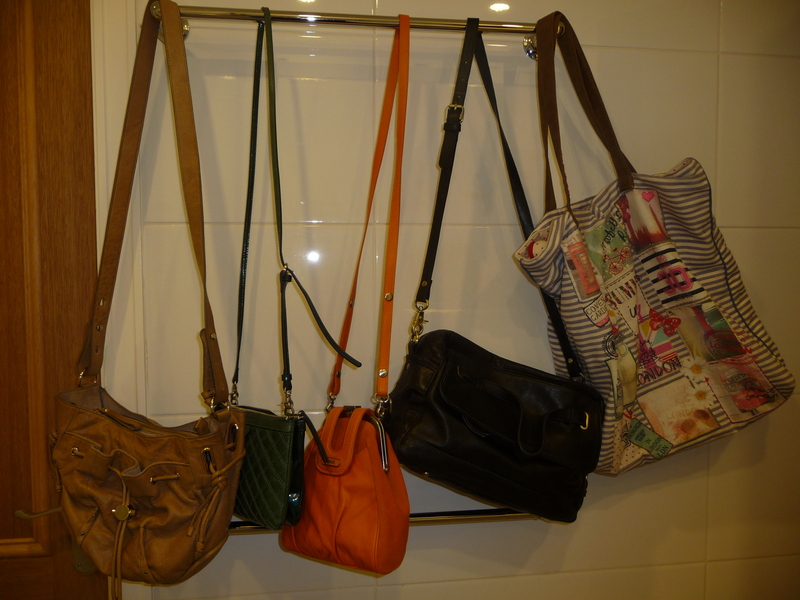 1 Hip Bag – Mimco again – a birthday present from my girls. Worn across shoulder which I always like for security reasons. This was large enough so I could put essentials in like money, phone, lippy, hairbrush and last but not least my passport. It also did not get counted as an extra piece of baggage meaning I could wear it cross body in addition to my cabin bag when I was only supposed to have 1 piece of cabin luggage. The one I took was a lovely dark green quilted on one side and patent on the other. If I had been travelling in the summer I would have taken my bright orange one instead! 1 Large Canvas Bag purchased from Accessorize in the UK. This along with my trusty hip bag became my bag of choice when touring round as for whatever reason it spread the load evenly so my shoulders (or Monsieur Le Chic’s) didn’t ache. Into it went water bottles, guide books, umbrella, accessories such as hats, gloves and also the camera (that was the one draw back of my hip bag it couldn’t hold my camera). The other great advantage was that it packed away completely flat into the bottom of a suitcase for the return journey to Australia when I had to revert to my usual cabin bag. 1 Soft Black Leather Day Bag – again cross body purchased a couple of seasons ago from Country Road. I used this a lot in the Uk when staying with relatives but found when we moved on to the touring part of the holiday it was less practical as then I needed to stuff more things into it and consequently felt like I needed to make an emergency visit to my chiropractor (not practical!) whenever I had been walking around for a while. However at least being so soft it also folded away neatly into my suitcase. This isn’t a foolproof system of course. I’m very safety aware and certainly apart from my camera did not put anything of any great value into the canvas bag (though of course it had a zip). Valuables for the most part were locked up in the safe of the hotels we stayed in and we only took what we absolutely needed for that day. My hip bag would not have sufficed if I was by myself as it did not hold that much and Monsieur Le Chic carried on him our travel documents such as rail cards and his wallet when we went out.